The images of South Korean photographer Jun Ahn are both riveting and alarming — especially after you learn that they’re not faked and each one of them is a self-portrait. Is the woman about to fall or about to dive? She’s perched on the edge of a skyscraper, with busy city streets hundreds of feet below her. Dressed in a blue-purple cocktail dress, she stands out against the concrete and steel of her surroundings like some exotic bird. The precarious position she has placed herself in triggers both thrills and trepidation in the viewer. Is she a performer, spinning variations on what tightrope walkers and trapeze artists do? Is she acting on a drunken dare at a party? Is she suicidal? The question of intent, in the work of South Korean photographer Jun Ahn, is an urgent one, and the images in “Jun Ahn: On the Verge” are both riveting and alarming — especially after you learn that 1) they’re not faked (no digital tricks, no collage work) and 2) each one of them is a self-portrait. Noon-9 p.m. Mondays-Thursdays, noon-6 p.m. Saturdays-Sundays, through March 24. Photographic Center Northwest, 900 12th Ave., Seattle; free (206-720-7222 or pcnw.org). The results feel like something genuinely new in photography. It’s tempting to see something political in them as well, though they all predate the chaos of the Trump era. They place you right on the precipice with her, with nowhere to go but down. Ahn is based in Seoul, where many of the photographs were taken. She also studied in New York, and frequently shot from the tops of Manhattan high-rises. The images’ success is the result of a rigorous selection process. Ahn, after gaining access to her locales, sets up her camera on a tripod and lets it fire away as she explores her dizzying surroundings. The spatial disorientation created by her work is extreme. While a strong sense of derring-do unites them, there’s considerable variety in the approach she takes. Some evoke sensations of floating or flying rather than an imminent plunge. In one, taken on the rooftop of Korean Telecom in Seoul, she balances on one leg as if engaged in a dance maneuver. In a terrifying 2011 New York shot, taken on the Fourth of July, she seems to be falling backward out of a high-rise apartment window as fireworks explode on the horizon behind her. It’s the top-down shots, however, that are most vertigo-inducing. 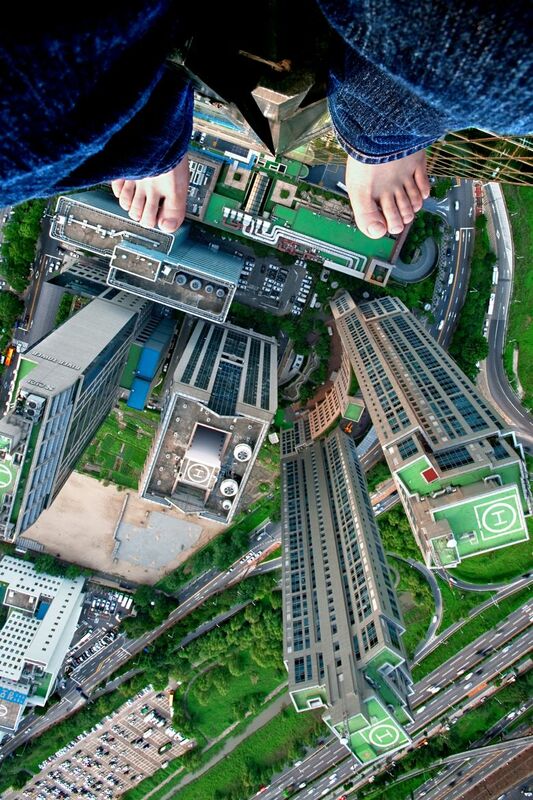 A 2008 photograph of her feet seen from overhead — dangling from Seoul’s 63 Building, the highest in the city in the 1980s — seems to place her miles above several nearby skyscraper-top helipads. In another atypically nonurban image, she’s perched high on a cliff top above roiling surf. One curious twist: These may be self-portraits, but Ahn completely obscures her facial features in all of them, sometimes masked by her dark shoulder-length hair and, in one instance, twisting her head away from the camera even as she leaves her naked throat vulnerably exposed to it. The tensions in her work between display and concealment, between conquest of public space and enigmatic personal odyssey, are both unnerving and delectable.